This section explains how to fine tune your survey with SurveyGold. 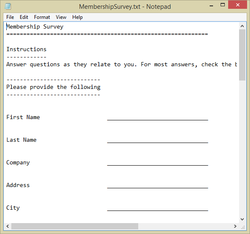 Finally, it shows how to quickly print a survey questionnaire form. You can quickly and easily print a professional-looking survey questionnaire form based on your survey questions. You can preview what this printed questionnaire would look like at any time. Step 1 - From the Setup Survey tab folder, select your survey. Then select Print Preview Survey in the button bar. Step 2 - Right-click in the print preview window to access a popup menu of options to navigate and print your survey. You can print a professional-looking questionnaire based on your survey questions at any time. Step 1 - From the Setup Survey tab folder, select your survey. Then select Print Survey in the button bar. Note: This printing option provides no flexibility in formatting. What you see in the preview is what you get when you print. 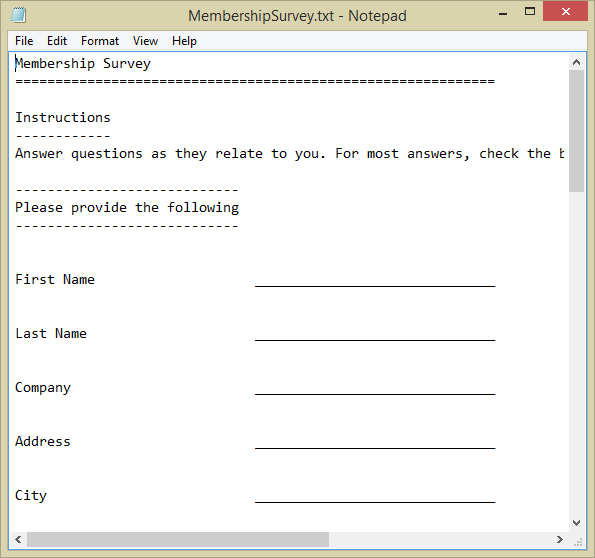 To create your survey form with minimal formatting, you may choose to save your survey as a text file. Step 1 - From the Setup Survey tab folder, select your survey. 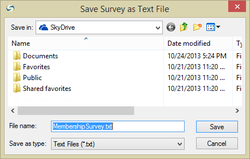 Then select Save Survey as Text File in the button bar. Step 2 - When the Save Survey as Text File window appears, verify that the file name is to your liking. Select Save to create the file. 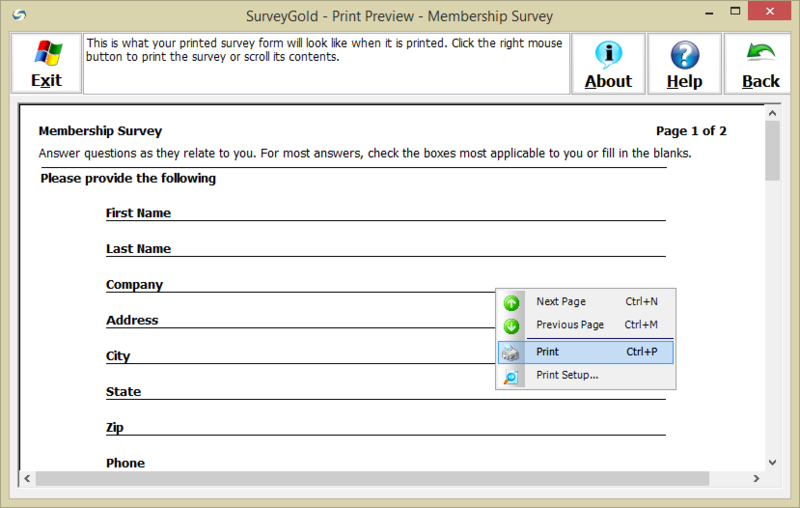 Note: SurveyGold automatically names the file using the survey name (removing any spaces from the name). However, you may rename the file to any name of your choosing prior to selecting Save. Step 3 - Upon completion, the text file opens in the Notepad editor. From there you can further edit the questionnaire and print it accordingly. If you prefer even more flexibility in how your survey form is formatted, you may choose to save your survey as a Microsoft Word™ document. 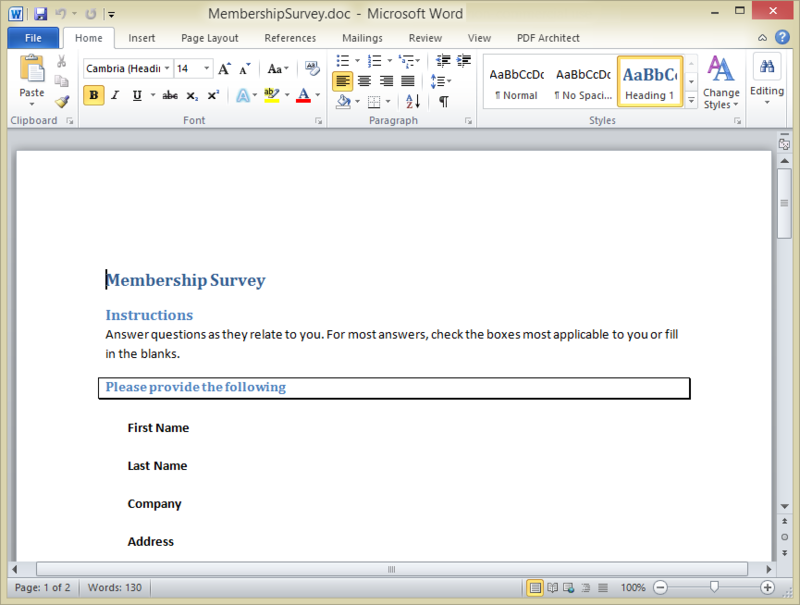 In the following example, you will see how easy it is to save your survey into a Word™ document. 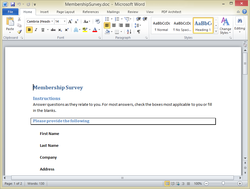 Note: SurveyGold only allows a survey to be saved as a Word™ document if Microsoft Word™ is installed on your computer. SurveyGold detects the presence or absence of Microsoft Word™ on your computer and enables or disables the feature accordingly. Step 1 - From the Setup Survey tab folder, select your survey. Then select Save Survey as Word File in the button bar. Step 2 - When the Save Survey as Word File window appears, verify that the file name is to your liking. Select Save to create the file. Step 3 - Upon completion, the text file opens in the Microsoft Word™ From there you can further edit the questionnaire and print it accordingly.